(Nanowerk News) Scientists have used neutron scattering to identify the secret to a metal-organic framework's (MOFs) ability to efficiently convert chemicals, through a process called catalysis, into new substances. By probing a material known as MOF-808-SO4, the team discovered molecular behavior that causes the catalyst to become less acidic, which could slow down the catalytic process vital in making products such as plastics, fragrances, cosmetics, flame retardants and solvents. Their findings, detailed in Nature Chemistry ("Identification of the strong Brønsted acid site in a metal–organic framework solid acid catalyst"), are expected to help spur the development of new MOF catalysts that industry can use to improve the process of turning substances such as petroleum into C8 chemicals—chemicals with eight carbon atoms. To study the MOF’s molecular behavior, scientists from University of California–Berkeley, Stanford, the Department of Energy’s Lawrence Berkeley National Laboratory and DOE’s Oak Ridge National Laboratory conducted experiments on the POWGEN instrument at the Spallation Neutron Source located at ORNL. They discovered what makes MOF-808-SO4 an efficient catalyst and why, under certain conditions, it loses its effectiveness over time. 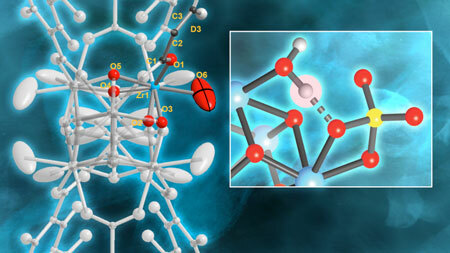 “We developed a new MOF that is a very good catalyst for the production of C8 chemicals, but we hadn’t identified the active site in the material that was responsible for its excellent catalytic performance,” said Omar Yaghi of UC Berkeley. “We discovered that one Brønsted acid site, in a very specific configuration, is primarily responsible for the MOF’s catalytic activity, and that the MOF becomes less efficient over time when the catalytic process causes the depletion of water in that site,” Yaghi said. Brønsted acids are chemical compounds that “want” to donate positively charged hydrogen ions to other base molecular structures that want to grab the protons. This occurs because they have extra electrons, giving them a negative charge that strongly attracts protons.